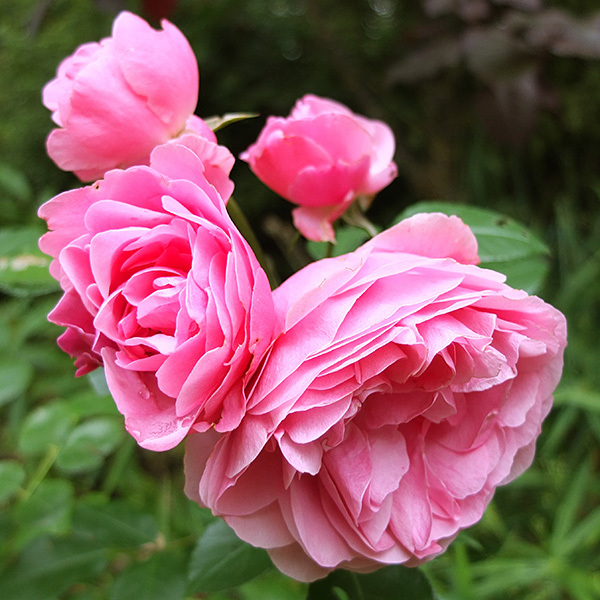 Da Lat rose is much favored not only in Da Lat itself, but also nationwide. Da Lat sells lots of its roses to the bigger cities, such as Ha Noi and Ho Chi Minh City. You can find many Da Lat roses in Da Lat markets. The flower comes in all sorts of colors and shades, such as red, pink, velvet and yellow. The yellow roses, which bears the name of Josephine, wife of the French emperor Napoleon Bonaparte, are much valued in Europe. They are also quite abundant in Da Lat. Da Lat brides love to decorate their weddings with the local white roses. Some other roses bear the names of movie stars, such as Princess Grace of Monacc (Actress Grace Kelly) because they have the colors of the dresses worn by these personalities. Some of Da Lat’s roses can last from seven to 15 days in vases. The peach blossom is a sentimental symbol of Da Lat. It reminds many natives of springtime in northern Viet Nam. Thoughslender, the peach blossom branch also exudes the solemnity and determination of the Vietnamese people. Flower connoisseurs often prefer peach blossoms that are bright red as rubies. Years ago, Da Lat used to have an entire forest of peach trees. Up until the 1970’s, one could walk along Cam Ly Springs. It flowed slowly from Xuan Huong Lake in the west to a cliff and dropped abruptly to make a majestic waterfall. Tourists could then see the brilliantly red shawl of peach blossoms up on the Da Cat Hill each spring. That forest now only remains in the memory of Da Lat elders and older tourists, as deforestation has nearly wiped it out completely. Fortunately, there are still quite a few peach trees grown near Xuan Huong Lake. They blossom during the Vietnamese Lunar New Year (January-February). The mimosa, which originally came from Australia, is three to six meters tall. It has bright yellow flowers and leaves that are green with a silvery luster. The tree blossoms two or three times each year and flourishes during the sunny seasons. Da Lat has two types of mimosa trees: long and short-leafed. Its scientific name is Acacia Podaly-riaefolia Cunn, Mimosaceae. According to folklore, Da Lat girls often like to place the mimosa between the pages of a book, then send it to their boyfriends. The flower retains its sweet scent, which is a reminder of her affection. Jacaranda Acutifolia, also known as purple flamboyant or flame tree, is another special feature of Da Lat, because its flowers are purple instead of the characteristic red color of its brother in northern Viet Nam. 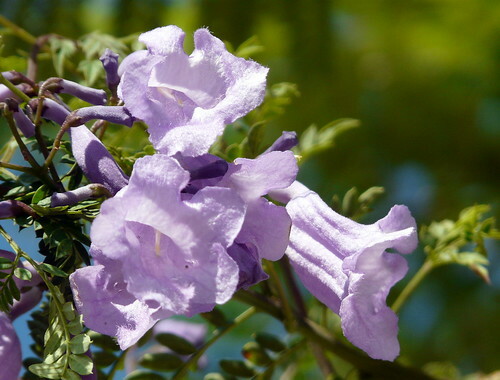 The tree’s scientific name is JacarandaAcutifolia. belonging to the Bignoniaceae family. Since its leaves are very similar to those of the mimosa, the purple flame tree is also called J. Mimosaefolia. Moreover, as its leaves bear the shape of an egg, the tree is also called J. Ovalifolia. The purple flame trees in Oa Lat blossom toward the end of winter and through spring. In the past, the entire town had only four purple flame trees, including three in the town’s flower park and one on Nguyen Thi Minh Khai Street leading to Da Lat Market (in front of Thuy Ta Restaurant). The purple flame tree came from Brazil. It is widely grown for ornamental purposes on roadsides and in parks in South America, Africa and Oceania. Vietnamese engineer Luong Van Sau was the first person to bring the purple flame tree to -Da Lat and grew it here. Mr. Luong Van Sau was also a member of the Societe Francaise des Roses. After him, other growers multiplied the purple flame tree in Da Lat. Hydrangea is grown in many places in Da Lat, especially in private gardens, at offices and in parks. The flower has been associated with an old Roman story. According to legend, in southern Europe, a beautiful Roman princess had reached marital age. But she rejected all the proposals from the most noble and wealthy men. One day, while she was making an excursion outside the town, she saw a general being cheered by a crowd. She threw the flower she was holding in her hand, and it landed on the general. That’s how she selected her husband. The flower is shaped like a ball. Its four colors change with each cycle of growth. When it first appears, the flower is white. Then it changes into light green, then dark green and finally purple. Orchid is another Da Lat attraction. Named “queen of the world of flowers,” the orchid is a common sight wherever you go in Da Lat. Among the world’s 100,000 species of orchids, Viet Nam already has many of which grow in Da Lat. Da Lat grows all four types of orchids found worldwide, including those on other plants and trees as parasites, those on high rocks and cliffs. Those in leaves and mud. Those on other kinds of vegetation. Lang Biang and Da Lat have a very interesting kind of orchid, Ian hai. In Vietnamese, “hai” is a beautifully embroidered shoe that used to be worn by noble ladies. The flower is so named as it has the shape of a “hai”. It originates from the species P. Delnatii. The flower received attention and praise at an international orchid exhibition in 1995 in Tokyo, Japan. Gladiolus is very popular among growers in Da Lat because it is easy to grow and yields high returns. As legend has it, a Roman general captured two young prisoners and kept them in his house. His two daughters fell in love with the two prisoners. When the general discovered this situation, he became angry and made the two prisoners fight each other in a duel. However, the two young men refused to fight and fixed their swords into the ground. The general ordered them beheaded. Strangely enough, as soon as their heads touched the ground, the two swords turned into flowers the shape of a sword. In Latin, “gladiolus” means a short sword. Da Lat’s gladiolus has several colors ranging from white, yellow, to purple. However, the most abundant is red and the most valued is the same red as Bordeaux wine. Da Lat sells its gladioli throughout the entire country, especially during the Vietnamese Lunar New Year (January-February). The Vietnamese believe it symbolizes promise and love. Pansy is popular in Da Lat not only because it adapts well to the local climate, but it adds to the romanticism that locals hold dear to their hearts. The flower has been grown in Da Lat since the French colonial days. Young sweethearts give each other the flower to express their warm feelings, just as its French name “pensee” suggests. The pansies are grown widely, especially around villas which bear its name such as Pensee 1, Pensee 2 and Pensee 6. Wild sunflowers grow abundantly along Road No. 20, the passes of Bao Loc and Prenn and in valleys around the town of Da Lat. Theflowers also grow plentifully in other provinces of the Central Highlands on the western side of the Truong Son Range, such as Kontum, Gia Lai and Daklak. They are thus considered the typical wild flower of the Highlands of southern central Viet Nam. The wild sunflower tree is one to two meters tall. Its flower is bright yellow and has a diameter of 10 centimeters. The tree begins to flower toward the end of the rainy season and blossoms profusely in the dry season. One can say the dry season has begun in the Highlands when you see lots of wild sunflowers outside. Do Quyen flower is grown in gardens or pots. It doesn’t shed its leaves. Its flower grows at the far end of the branch and has 3-cm long petals. Da Lat has four varieties of Do quyen: white, pink, red and orange. The most numerous are pink. Most of the do quyen varieties sold at the market are imported from overseas. However, the red one is native to Lang Biang Mountains. Nature has granted Da Lat a graceful beauty making it an ideal tourist destination, of which land scape exudes a sweet fragrance and shows off var colors all year round.